Whether you are building your own LED fixture, fixing and retrofitting existing fixtures, or purchasing new LED lights, you will need to find the correct power source for your LEDs. You will either need a constant current LED driver or a constant voltage power supply (or a combination of both) in order to make your LEDs work properly. There are many different factors to consider when choosing a power supply for LED lighting. This post will go through those many factors and help you select the right power supply for your LEDs! Most LEDs need a current-limiting device (whether that be a driver or resistors) in order to prevent LEDs from being over driven. This constant current driver or current limiting resistor is used to regulate current to the LEDs, keeping them running safe and maximizing their lifetime. LEDs electrical characteristics change as they heat up; if current is not regulated, LEDs will draw too much current over time. 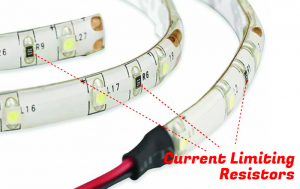 This overdraw of current will make LED brightness fluctuate, leading to high internal heat that will eventually lead to failure of the LED light. If you are building your own LED fixture or working with any of our component star LEDs, you will need a constant current device within your system. Most finished LED products or LED strip lights (that you would buy straight from the store) already have drivers or resistors built in to regulate the current. If you are unsure whether you need a constant current source, take a look at this helpful post in order to find out. If you don’t have a current limiting device, finding a driver is your first step; but if your LED product already has current under control, you can follow this post in finding a constant voltage power supply. A constant voltage power supply can be used to power LED lights that have resistors or constant current drivers already within the system. These types of products will typically call for a constant DC voltage. If you are powering from a battery or happen to have a constant DC voltage that is adequate for your lights, then consider yourself lucky. Nine times out of ten this will not be the case and you will need a power supply to convert your power to a safe DC voltage for your lights. For example, LED flex strips have on-board current limiting resistors (as you can see built onto the flex board base). If you wanted to install this in your car, you wouldn’t need any power supply. Cars batteries give off 12VDC give or take. The 12V supply from the battery would be totally adequate for your lights. But in order to incorporate these strips in homes there is the need for an AC to DC converter that will take the 120VAC standard household voltage and convert it down to 12VDC. So you need some type of constant voltage power supply that can convert your AC household voltage down to a safe DC voltage. There are many things that factor into finding the right power supply for your needs. First, we should lock down the power we require from our power source. Say for example we have 4 runs of LED strips that run at about 12 watts each. Simply multiplying these will show that our system wattage should be right around 48 Watts. Now we can add the 20% recommended cushion on with 48 x 1.2 = 57.6 Watts. A 60-Watt (or higher) power supply will suffice for this project. Another common application is using high power LEDs with constant current drivers that require a DC voltage input. Say we have six Cree LEDs running off of a Mean Well LDD-H driver. Each LED runs at about 3.1 volts. With four of these our total voltage in this series circuit would be 18.6VDC. Typically, low voltage drivers like the Mean Well LDD-H work better if you have a small cushion over the voltage they require. For this setup I would use a power supply outputting at least 24VDC. Note that you should always make sure the low voltage driver in use (Mean Well LDD-H in this case) is rated for the voltage you want to input. The Mean Well LDD-H can take 9-56VDC so we are all set in this situation. Find more about calculating your voltage within different circuits here. PWM Dimming: Also known as pulse-width modulation dimming, can be used on all power supplies. Even the power supplies on our site that don’t say ‘dimmable’ right in the specs can be dimmed through wall mounted or remote PWM dimmers. This is because PWM dimmers go in-line with the strip lights, dimming on the 12VDC side of the circuit. PWM dimmers actually pulse the lights at high frequencies to change the perception of light to the naked eye. The higher the frequency, the brighter they will be. TRIAC Dimming: This type of dimming allows for LEDs to be dimmed with standard dimmers. You must look to make sure a power supply qualifies for alternating current (TRIAC) dimming by checking the specs. Our current products that offer dimming controls like this are the Magnitude Dimmable Power Supplies. These power supplies work by varying the power on the AC side of the circuit via a TRIAC dimmer. The change in power that the dimmer creates on the AC input side will vary the voltage on the DC output and control the brightness of the LEDs. TRIAC dimmers can be found in common hardware stores. Most popular/recognizable brands would be Lutron and Leviton. An important factor that cannot be overlooked when choosing your power supply is the area and environment that it will be used in. Power supplies operate the most efficiently if they are used within their temperature parameters. Power supply specs should include a safe operating temperature range. It is best to operate within this and make sure not to stick your power supply somewhere where heat can build up and go above this maximum operating temperature. It is generally a bad idea to stick a power supply in a tiny enclosure with no ventilation system. This will allow even the minimal heat produced by the source to build up over time and end up cooking the power source. So make sure the area isn’t too warm or cold and that the heat cannot build up to damaging levels. Each LED power supply will also have an ingress-protection (IP) rating. IP ratings consist of a two-digit code that indicates the size of solids and pressure of liquids that a power supply can resist. The first number refers to the size of solids that the unit can withstand, whereas the second number refers to the amount of liquid the unit can withstand. As each number increases, so does the level of protection. As the first number increases the product becomes protected by smaller and smaller objects (all the way down to dust particles) making it less susceptible to anything getting in and harming it. As the second number increases the product goes from being only protected in light rain to being protected in full immersion. Take a look at the helpful chart below and make sure you have a power supply with an IP rating that will protect your source from the environment it will be in. The efficiency of a power supply tells the amount of power that actually goes toward making the LED light up. The higher the efficiency percentage of the power supply-the more power you end up saving. For LED applications it is a good idea to select a power source with 80% efficiency or higher. Check out Mean Well and Phihong power supplies for the most efficient selection as they have efficiency ratings running well into the 90 percentile. When selecting a power supply for your LED project it is important to know where it needs to fit or be installed. If you wish to put it inside the product you are making, it has to be small enough to fit in the space provided. If it is outside the application, it should have a way to mount close by. There are a variety of power supplies offered in different sizes and shapes to fit your needs. Class II or Class 2?? It is easy to confuse these two ratings so let’s make sure we have the hang of it now that we are towards the end of understanding LED power supplies. A Class 2 power supply is in accordance with limited power levels defined by the National Electric Code (NEC) and fulfills the Standard UL 1310 requirements. Class 2 power supplies are limited to 60VDC and 100 Watts. Since their power is limited, Class 2 power supplies cannot power as many LEDs as others outside the rating. This is where you must determine if you want to run a longer length from one power supply, or stick with the safety of a Class 2 power supply which are protected from fire and electric shock. A Class II rating actually just refers to the input and output wires being double insulated. Class II drivers are popular as they do not require a ground connection. Hopefully this post has been helpful in aiding you to find the right power supply for your LED lights. There are plenty of options to choose from so take your time and select the one that fits best in your situation and has the safety requirement from the area surrounding it so that it is set to last a long time. If you are looking for a place to start I would highly recommend Faithful Power Supplies, we are a reputable brand with plenty of LED drivers and supplies with fantastic warranties. For technical questions or if you need more help please feel free to call us at (0086) 15817420542 or email info@www.faithfulpower.com. Our technical support team is available 8 a.m. to 5 p.m. EST Monday-Friday. Why is a SMPS used? Power supplies are mainly categorized as linear power supplies and switched mode power supplies. In a linear power supply, the input voltage from AC mains is first stepped down using transformer.Stepped down voltage is then rectified and filtered using a capacitor. This unregulated dc voltage across the capacitor is finally given to linear regulator which converters it into regulated DC voltage as shown in the following figure. In switched mode power supply (SMPS) input voltage from AC mains is directly rectified and filtered using a capacitor. This unregulated dc voltage across the capacitor is then given to a high frequency DC to DC converter which converters it into regulated DC voltage as shown in the following figure. The usage of a transformer at high frequency (>20 kHz) in SMPS instead of using it directly at 50/60Hz as in linear power supply drastically reduces the size of a transformer which in turn decreases weight and size of power supply. This is the reason behind light weight and compact size power adapters such as mobile, laptop chargers. Moreover, an efficiency of SMPS is typically more than 80% which is very high as compared to linear power supplies as in linear power supplies, current passes through switch operating in an active region (larger voltage drop)and hence it results in high power dissipation (lower efficiency) unlike switch operating in the saturation region (lower voltage drop) in SMPS. This also makes the operation of SMPS possible with a wide range of input voltage. In the future we will keep and continue steady ? Quality is the body we live by; Service is the food we eat; Delivery time is the water we drink; Experienced from a baby.